Is a rebuild kit right for me? : We get this question quite frequently and there is no definitive answer. Rebuilding a power steering pump or rack is only a matter of disassembly and seal replacement. If you are comfortable with standard hand tools, enjoy working on your own car and want to save a few dollars by doing the rebuild yourself then Yes. You have come to the right place. What is in the kit? 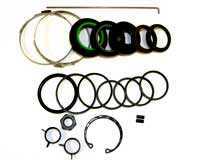 : The kits include every seal, o-ring and internal wear component inside your power steering rack or pump. This is the same kit the "rebuilders" use when they make an old power steering rack or pump new again. How are the kits shipped? : We use Priority Mail service from the United States Postal Service. Most kits fit inside a small "flat rate" envelope and this saves you on the shipping costs. When will my kit ship after I order it? : Some kits are built to order and other high volume kits are on the shelf and ready to go. As a rule of thumb your kit should ship anywhere from 1-5 days after you order it. Do you ship out of the United States? : Yes. We use Global Priority Mail from the United States Postal Service. Global packages arrive within 1 to 2 weeks after they ship from us. The delay in arrival depends on how long the package is held in customs before it is cleared for delivery in the destination country. Do you offer support for the installations? : This is a tough one and I wish we could say that we do. With so many variations of pumps and racks we cannot trouble shoot every installation question. If you just remember to mark the orientation and replace all the seals during disassembly you should have no problems. A few common questions are listed in our FAQ section that may help you out. Can I order over the phone? : Yes. If you are not comfortable ordering online or are having difficulties please feel free to give our sales office a call at 352-466-0219 .